Robert Kirkman hardly gives us a moment to recover from last issues flesh ripping cliff-hanger, before All Out War reaches a whole new level of explosive action in The Walking Dead #120 as the Saviors launch a devastating attack on Alexandria. 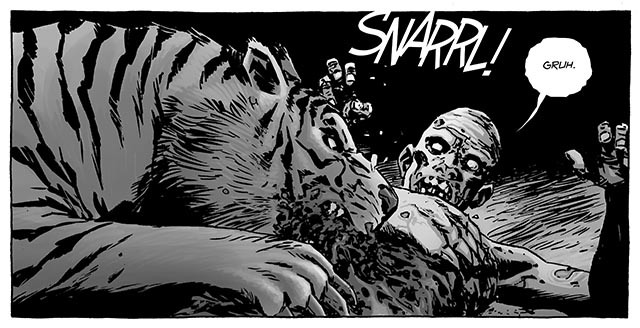 Negan’s twisted ploy, turning Holly into a Zombie and using her against her friends like this, is truly horrifying. The Saviors attack is ruthlessly efficient, with Negan’s men using grenades to inflict terrible casualties on Rick’s people, destroying buildings, and sending everyone diving for cover. What’s more, even though Denise was bitten by Holly, she refuses to let Rick amputate her arm, as her boyfriend Heath had been seriously injured and she needs both her arms to save him. All Out War is certainly beginning to live up to its name. The pace of this issue never lets up for a moment, with explosions going off all around them, Rick and his people have to quickly regroup and plan a counter attack. Jesus is soon right in the think of the action, instinctively doing whatever it takes to fight back. Meanwhile, outside the walls of Alexandria, the question surrounding Dwight’s allegiance to Rick’s alliance is finally answered. Charlie Adlard’s art for this action packed issue is superb, buildings get blown up, horrific injuries are suffered, and things take a dramatic twist when another major character is wounded. Steafano Gaudiano’s inks also bring added intensity to the carnage. 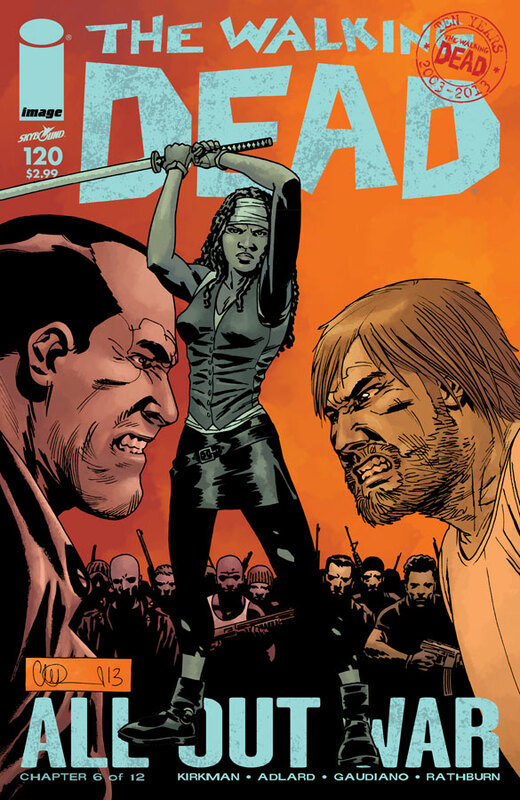 The Walking Dead #120 is a really exciting issue, things are not looking good for Rick and the survivors, with Negan and the Saviors ready to press home their advantage, All Out War is really beginning to hit its stride. 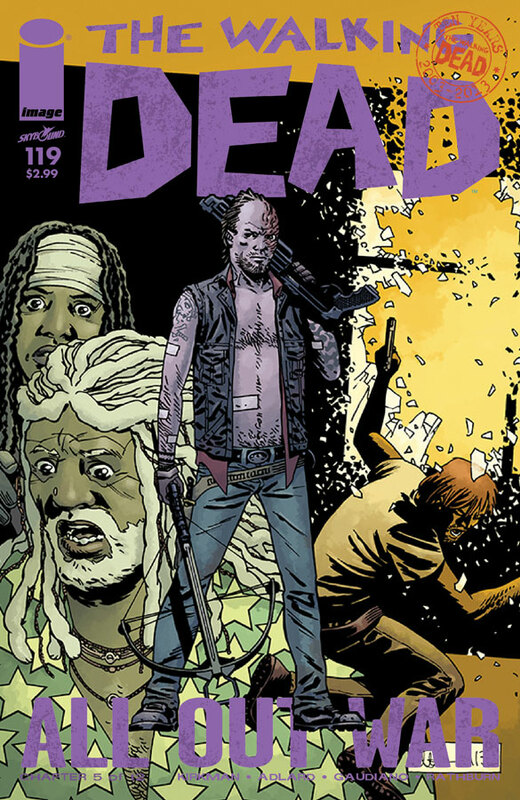 The Walking Dead #118 sees a marked change in pace as Robert Kirkman shifts the emphasis back to some of the secondary characters, with Maggie and Ezekiel taking centre stage for most of this issue. I particularly liked the scene where Maggie stood up to Gregory and the other deserters who abandoned Rick during the first battle against the Saviors. 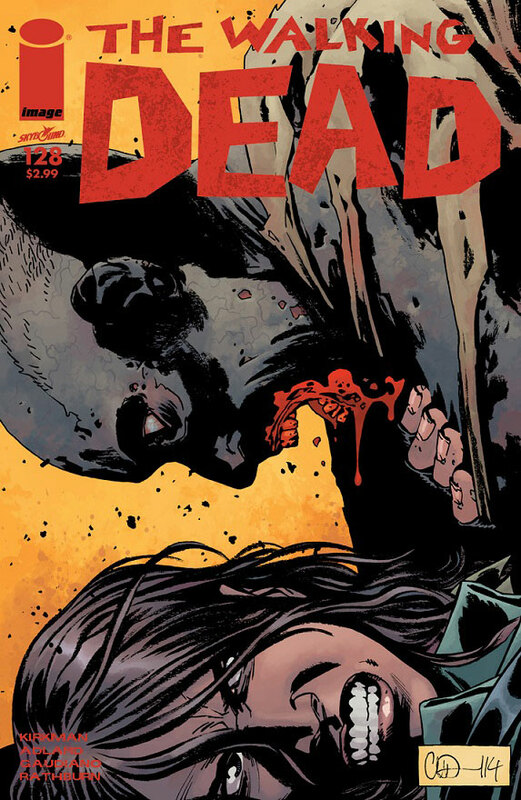 All the pent up rage and fury that Maggie has bottled up since her husband was killed by Negan in issue #100 rips through Gregory’s feeble lies and excuses like a machete through a Zombies putrefied skull. The way Maggie deals with Gregory and then addresses the rest of the Hilltop community is a great moment, and one which may ultimately prove crucial in maintaining the alliance Rick has fought so hard to build. 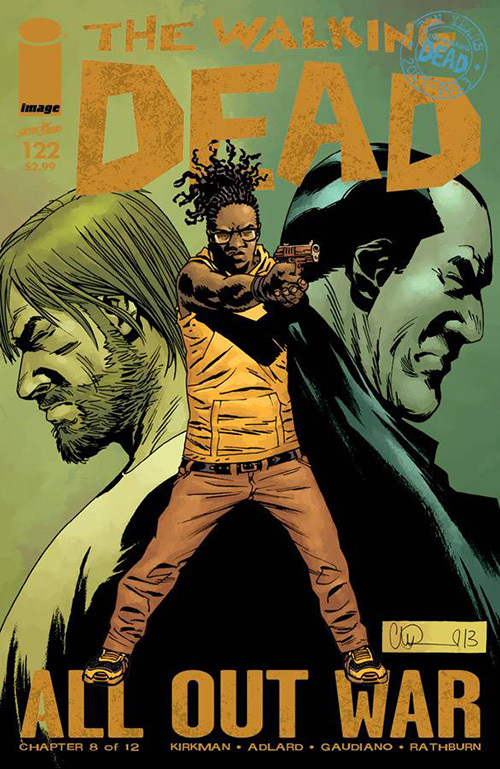 We also get a great interlude between Michonne and Carl, where he admits how scared he is as well, but the real highlight of this issue is the scene where Ezekiel recounts how a raid on one of the Saviors outposts went horribly wrong, leaving him alone and fighting for his life as the Walkers closed in. It is here, in this quiet moment were Ezekiel tells Michonne what happened, that Robert Kirkman explores the character in even greater detail then ever before. We are now so used to Ezekiel’s regal persona as leader of the Kingdom; it is something of a shock to see him admit to being so afraid and desperate. Now having seen first hand the harsh reality of this war, the terrifying events that Ezekiel has just endured makes the telling of his story all the more tragic. Charlie Adlard’s art really hammers home the emotional impact these events have had on the characters, as matters unfold with growing intensity, before Maggie decks Gregory and Ezekiel tells Michonne how he escaped the Zombies. 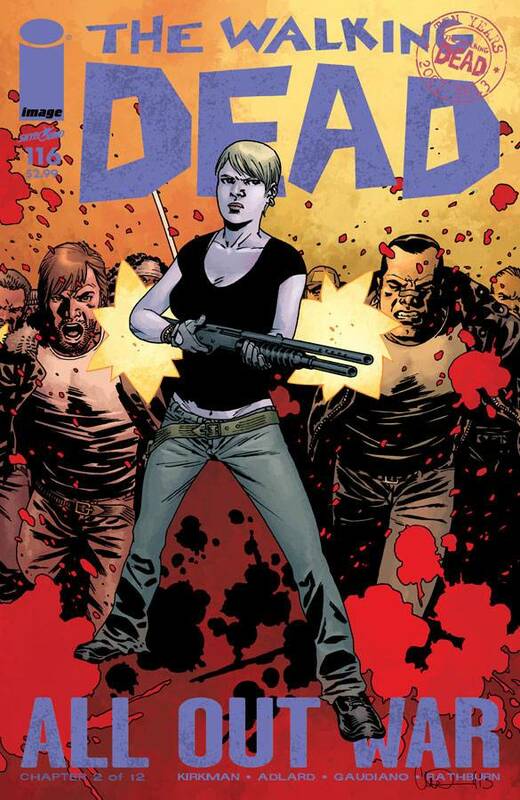 The Walking Dead also benefits immensely from the addition of Stefano Gaudiano’s work on inking Adlard‘s art, brining an added intensity to the issue which really heightens the drama. 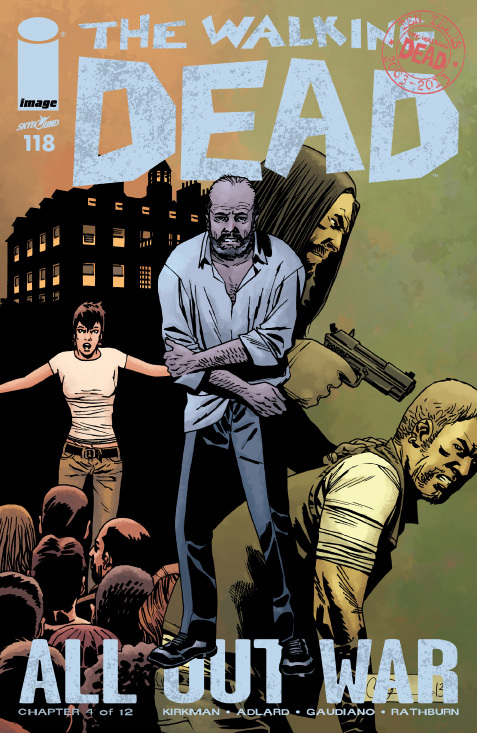 Although not the most action packed issue of All Out War, The Walking Dead #118 does however give Kirkman the chance to focus on some great character development for Maggie and Ezekiel, which together with Adlard and Guadiano’s exceptional work, delivers a highly entertaining, and thought provoking issue. The first battle of Rick’s war is over. While Rick’s plan left the Savoirs trapped inside their own base, surrounded by Walkers attracted by the gunfire, Holly bravely sacrificed herself to breach the Savoirs defences, and was then taken captive by Negan. It was great to see Rick and his allies using the Walkers to their own advantage last issue, effectively pinning the Savoirs inside their compound, but Negan isn’t going to give up without a fight, as The Walking Dead #117 clearly illustrates just how resourceful and cunning the Savoirs leader can be when he’s backed into a corner like this. At first Negan thinks he has captured Andrea, someone who he can use to break Rick’s spirit, but Holly reveals she was with Abraham as she tells Negan and Dwight why she drove the truck herself to smash the gates and let the Walkers in. 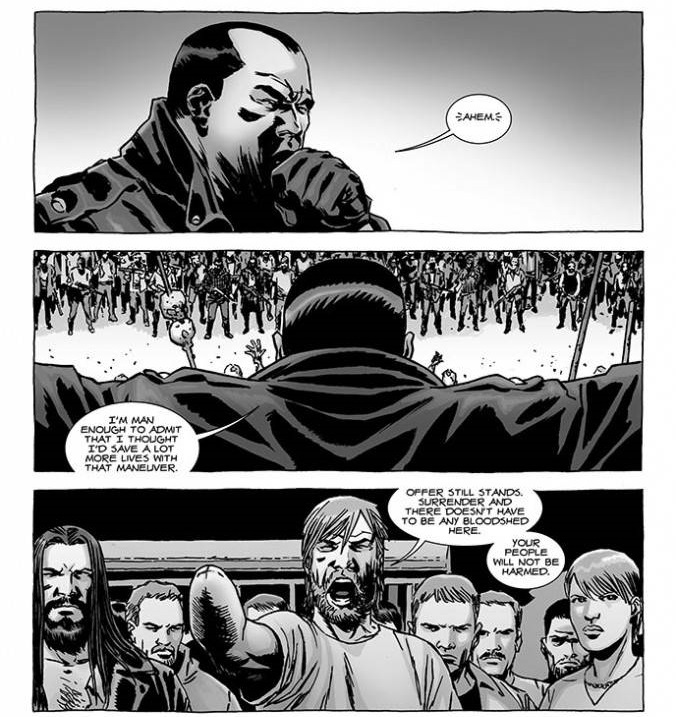 As Rick and the others regroup, Robert Kirkman uses this interlude to show what effect Holly’s sacrifice has had on the others, while Michonne, Ezekiel, and Shiva deal with some more Walkers. Rick then asks Michonne to return with a group to their community to help Andrea and Carl, just in case Negan manages to strike at them before they can return. Michonne agrees, even though she is unsure that they should be dividing their forces at this time, while Ezekiel will remain with Rick’s group and help take out the rest of the Savoirs outposts. The art by Charlie Adlard is excellent, there are some outstanding pages featuring the Walkers attacking Negan and his men as they try and beat back the undead horde, where they soon find themselves outnumbered and have to quickly retreat inside. It was a good move to bring inker Stefano Gaudiono to The Walking Dead for All Out War, his inks bring an added clarity and shade to the bleak environments, and the Zombies look even more menacing. Robert Kirkman continues to show us more sides to Negan’s character. The Saviors leader delivers an expletive laden rant when his attempt to clear a path through the Walkers fails, knowing the urgency to get out and strike back is now crucial to their survival, Negan orders his people to figure out a way to attack the Zombies from a distance. What follows is a scene where Negan discover that one of his men, David, is about to assault Holly. 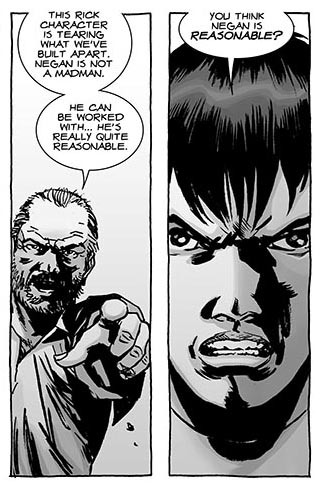 Appalled by what nearly happened Negan’s justice is swift, and ruthless, as he punishes David for defying the rules. It becomes clear that Negan is looking at the bigger picture here, at how they will all have to work together when the war is over, and that sinking to such inhuman levels is completely unacceptable, even for him. While the Saviors leader remains highly unpredictable, Negan’s twisted logic indicates that he is not an adversary to be underestimated. 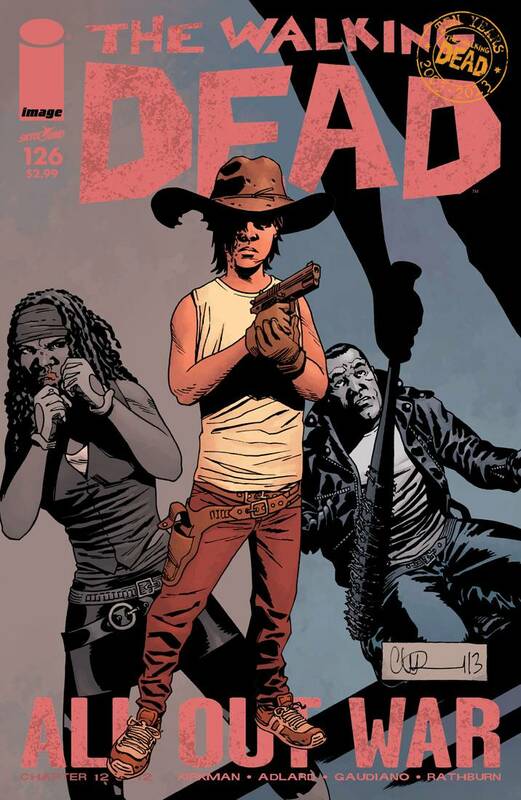 The Walking Dead #117 sees Rick preparing to divide his forces between dealing with the Savoirs outposts and protecting Andrea and the others, as she is sure to be the focus of any counter attack launched by Negan. Whether this is a good move or not remains to be seen, Rick could be spreading his forces too thin, and that could very well give the Saviors the opening they need to strike back when they least expect it. This third part of All Out War has certainly seen no let up in the action, Robert Kirkman continues to build the suspense, and the art by Charlie Adlard and Stefano Gaudiano delivers some spectacular scenes where the zombies attack in force. 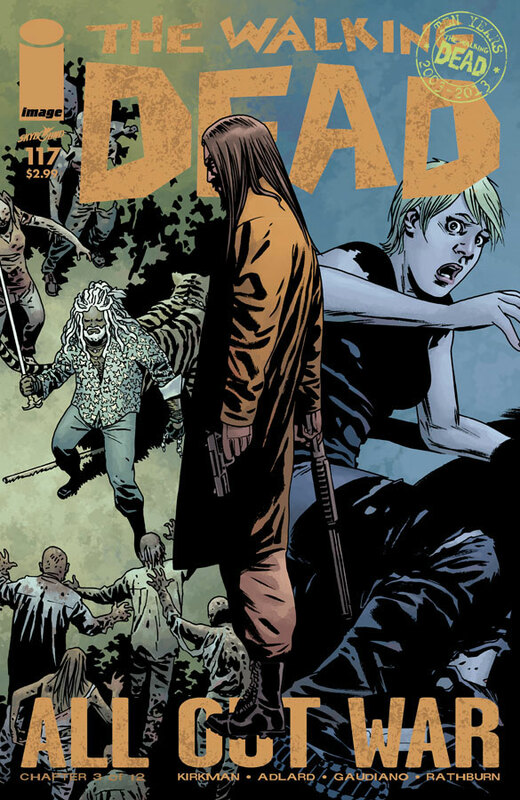 The Walking Dead #17 is another really good issue, battle lines have been drawn, and with both sides are preparing to make their next move, All Out War is shaping up to be an epic event. 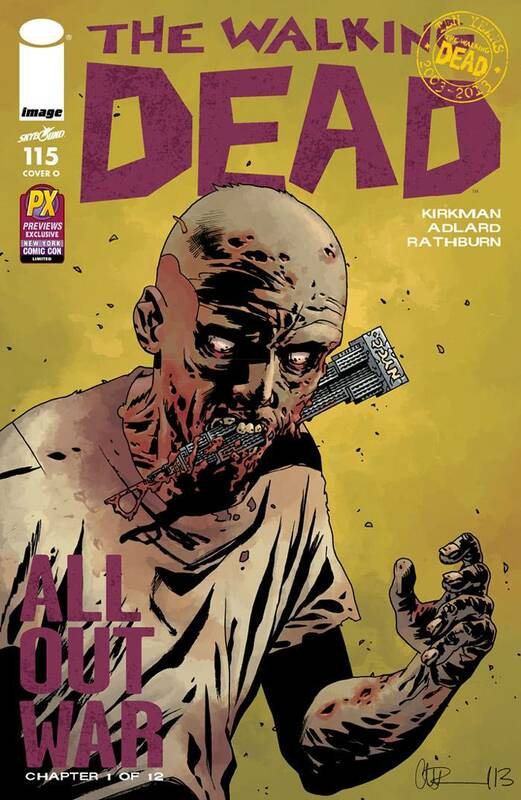 The Walking Dead #115 is the beginning of the 12 part All Out War story arc to celebrate the 10th Anniversary of Robert Kirkman and Charlie Adlard’s epic comic book series. This monster event will tear through the lives of everyone as All Out War breaks out in The Walking Dead #115, the first chapter of a storyline that will see Rick Grimes and his group of survivors fighting for their lives in a conflict involving all factions of the Walking Dead universe: The Saviors, The Hilltop, and The Kingdom. The Walking Dead #115 beings with moments of quiet reflection as Rick wakes early, the responsibility of the war he is about to start weighing heavily on his mind. Andrea reassures Rick that he has made the right choice, and that no matter what it takes to win this war, she knows the outcome will be worth it. Meanwhile, Ezekiel and Michonne have spent the night together, although neither are willing to commit to anything just yet. Whether anything will come of their relationship remains to be seen, however, Michonne does believe their time together may have the potential to “mean” something more eventually. 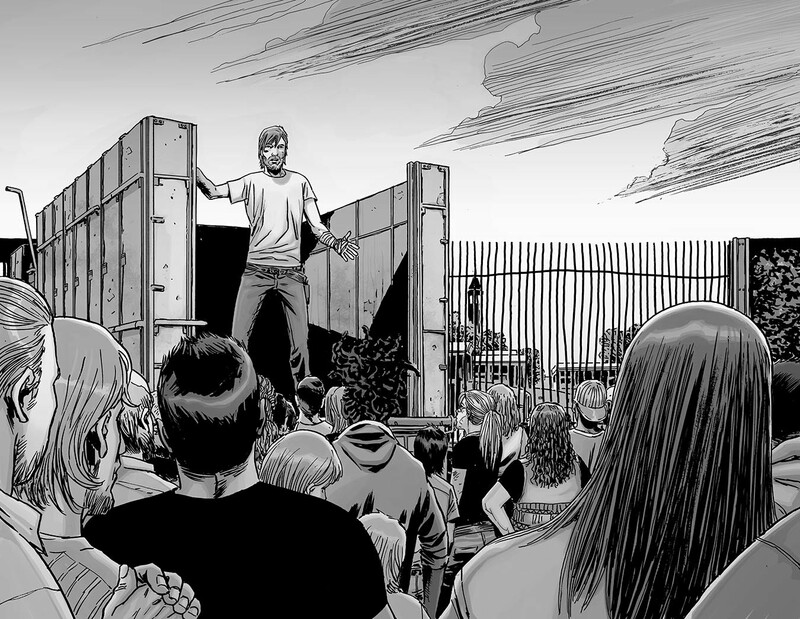 With everyone working flat out to prepare for the attack on the Saviors, Rick, Jesus, and Ezekiel get ready to move out, but before they leave Rick stands up and addresses everyone. Rick knows that everybody has put their lives on the line by supporting him in his fight against Negan, he thanks them all before they set out, saying how he believes the dark path they are about to take will lead them to a better place in the end. Andrea, who is still recovering after fighting one of Negan’s men in the Bell Tower, is staying in Alexandria with Carl. Before he goes, Rick entrusts Carl with more responsibility, seeing as he did so well at organising the people on the wall after Rick’s failed attempt to kill the Saviors Leader backfired and left them easy targets for Negan’s snipers. Rick and the others board the trucks and drive to the Saviors base, where Rick issues his demands as Negan looks on. Rick offers Negan a chance to surrender peacefully or face the consequence, but Negan has a very different plan, and a surprise of his own waiting for them. All Out War gets under way as Rick and his new allies embark on their mission to deal with Negan once and for all. 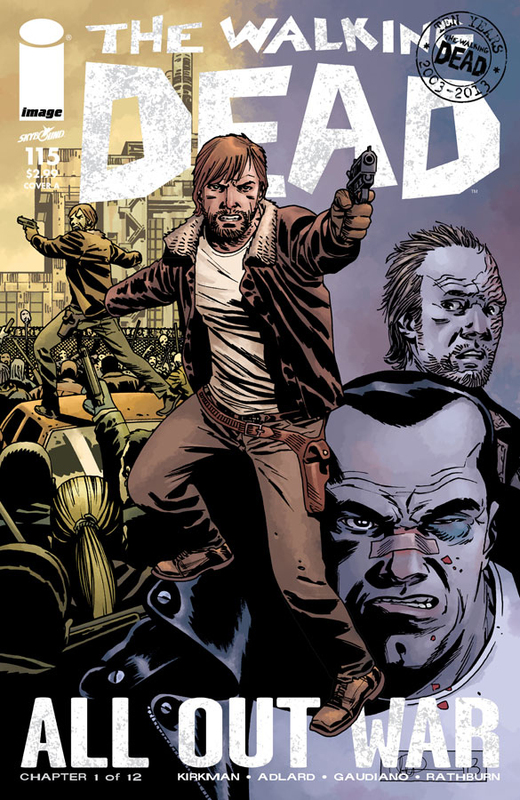 The Walking Dead #115 opens with a brooding sense of anticipation, as Robert Kirkman shows us how Rick manages to face up to his own doubts and rally his forces in the build up to the confrontation with Negan. Kirkman includes some great scenes between Rick and Andrea, and there is a nice moment between Rick and Carl before he leaves for the battle. We also discover that Ezekiel stayed over at Michonne’s, not that surprising really, as the chemistry between them has bee simmering ever since they first met. Its going to be interesting to see how their relationship develops over the course of All Out War, and I expect if they are going to live together, then Ezekiel’s pet tiger, Shiva, is going to have to be housetrained! Negan is as vile as ever, delivering a foul mouthed diatribe at Rick from his vantage point above the Zombie infested barricade of the Saviors base, yes we do get to see some Zombies this issue as well! Of course no one seriously expects that Negan will give in to Rick’s demands, even though he is faced with the combined might of the hilltop communities, Negan has got a counter proposal that manages to keep him one step ahead of his enemies. Charlie Adlard’s art on The Walking Dead is as excellent as ever, there are some great full page scenes crowded with characters, and the attention to detail is quite remarkable given how much the cast has grown recently. As The Walking Dead is now going bi-weekly during Al Out War, Adlard is assisted by Stefano Gaudiano’s inks, which brings an added depth to the grey tones. Along with the standard cover, The Walking Dead #115 has been released with a series of 10 individual connecting covers, each marked B-K, while cover O was a special NY Comic-Con- exclusive that was only available at the show. 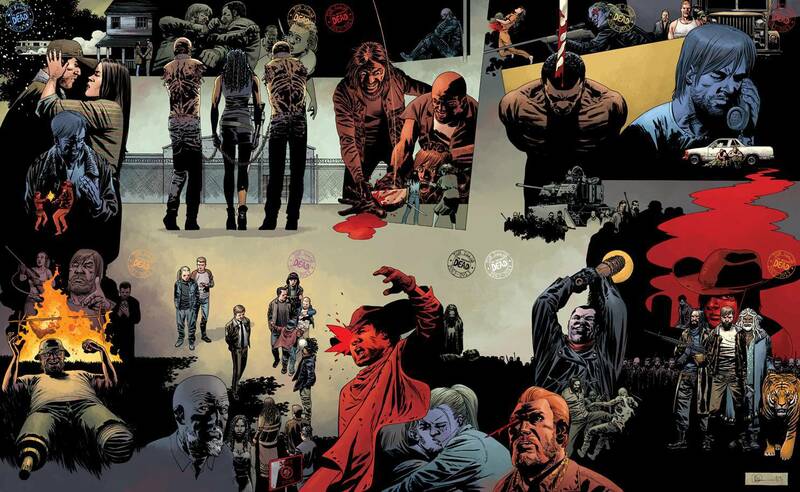 Each cover draws on the major events over the last ten years of The Walking Dead comic series, and collectively they certainly get these 10th anniversary celebrations of to an impressive start. 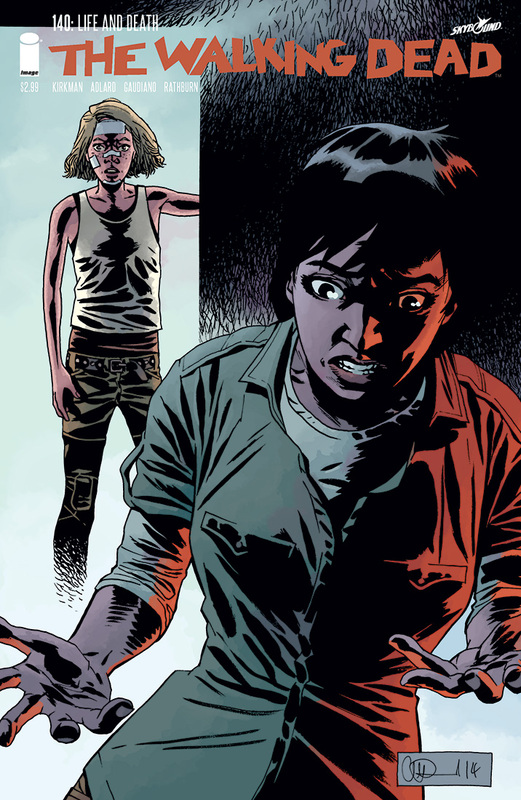 The Walking Dead #115 if a confident opening to All Out War. The Battle is about to begin, all the major players are in position, and if the closing moments of this issue are anything to go by, the carnage is about to be epic.